2017-18 Ski Season Notice: Due to logging on the National Forest in the area, portions of the trail are closed again for the 2017-18 ski season by order of the Forest Supervisor (Closure Number: R0907-15-12). We apologize for the inconvenience and hope to have the trail open in its entirety next season. See map of trail closures below. Covenant Point is happy to maintain and groom over 16 kilometers on the Ge-Che Cross Country Ski Trail, on the Ottawa National Forest. The trail is groomed for classic skiing only. We provide this service in partnership with Ottawa National Forest for all to enjoy. There is an optional donation box at the trail head near camp, as well as ski maps available. Covenant Point also rents cross country skis and snowshoes to the public for $10/day. If planning to rent, please call ahead, as our guest groups are given first priority and our office hours and days vary during winter retreat season. Covenant Point: (906) 265-2117. Trail grooming updates are posted to CPBC’s Facebook and to skinnyski.com. 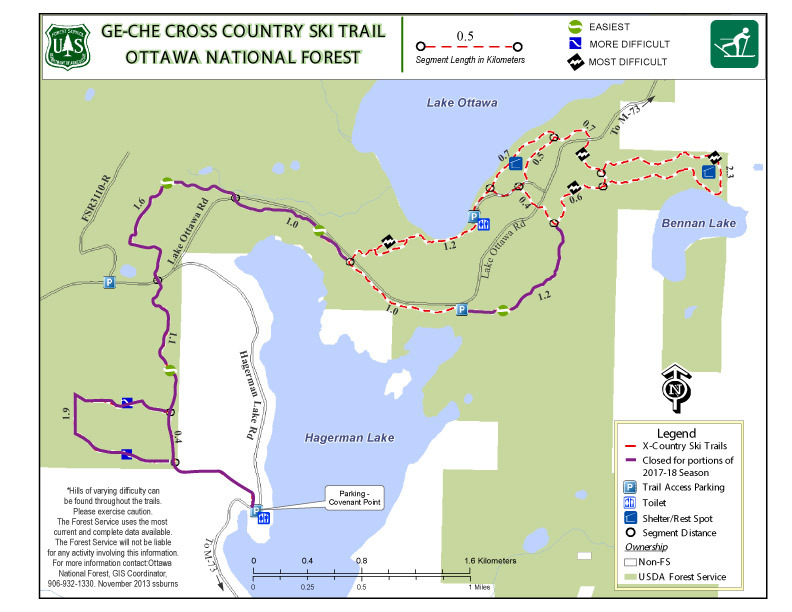 Download a Ge-Che Ski Trail Map here. Click here for Trail Grooming Updates.